GHL has been working with LED technology for the aquarium hobby for many years now. Our continued research as allowed us to create LED lighting products capable of providing lighting conditions the way nature intended. We have been manufacturing LED products since 2002. Products include: dimmable led lights for moonlight, sunrise, sunset, and thunderstorm simulations all of which can be found in our product range. In addition, we also offer drivers for connecting LED luminaires from other manufacturers to the ProfiLux or for DIY lights. With the LEDControl1 V200, it is possible to control and dim third-party products such as TMC Aquaray® of TMC and SunaECO Tropic Marin® with the ProfiLux Controller. 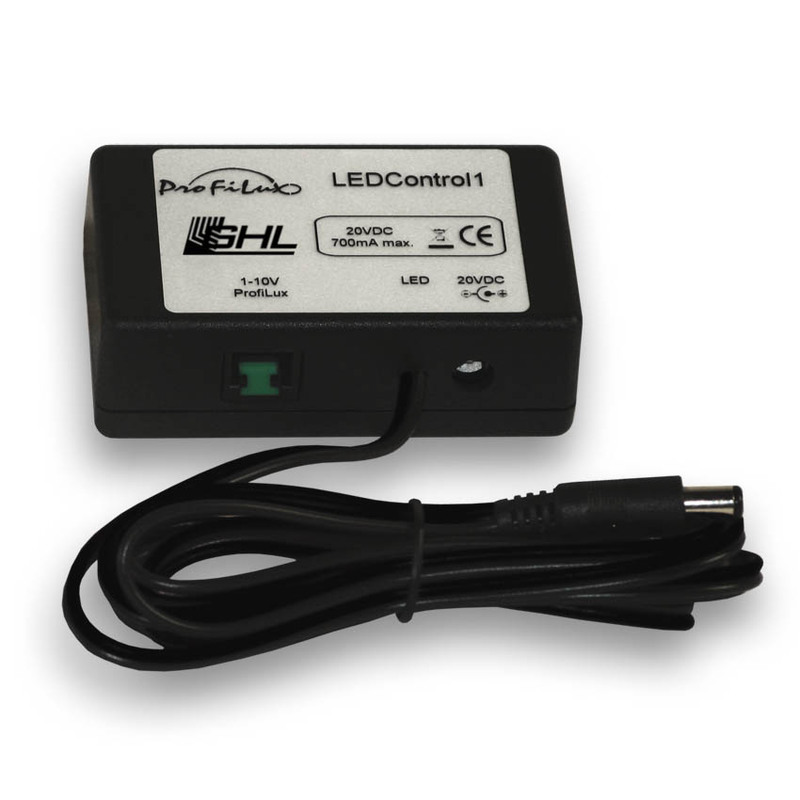 LEDControl1 V200 is simply looped in the aforementioned LED lights between the power supply and lamp, so you can take advantage of the unique illumination features the ProfiLux provides. To connect a power supply (AC adapter not supplied by LEDControl1) LEDControl1 has a DC power jack. The LED light is connected to the plug of the black connection cable (1.5 m length). With the included western cable (length ca. 1 m) LEDControl1 is connected to an 1-10 V-interface of the ProfiLux (e.g. L1L2 oder L3L4). With a jumper inside the device you can select, if LEDControl1 should react to an odd or even 1-10 V-interface. The LEDControl4 V2 with integrated drivers allows you to dim LED lights, which are operated with a constant voltage such as LED chains that have a series resistor. LEDControl4 V2 does not include acurrent controller, just the minus potential of the connected power supply is clocked through PWM! We recommend checking if your LED light is suitable for operation at a constant voltage, otherwise your LED light and LEDControl4 V2 can be destroyed! 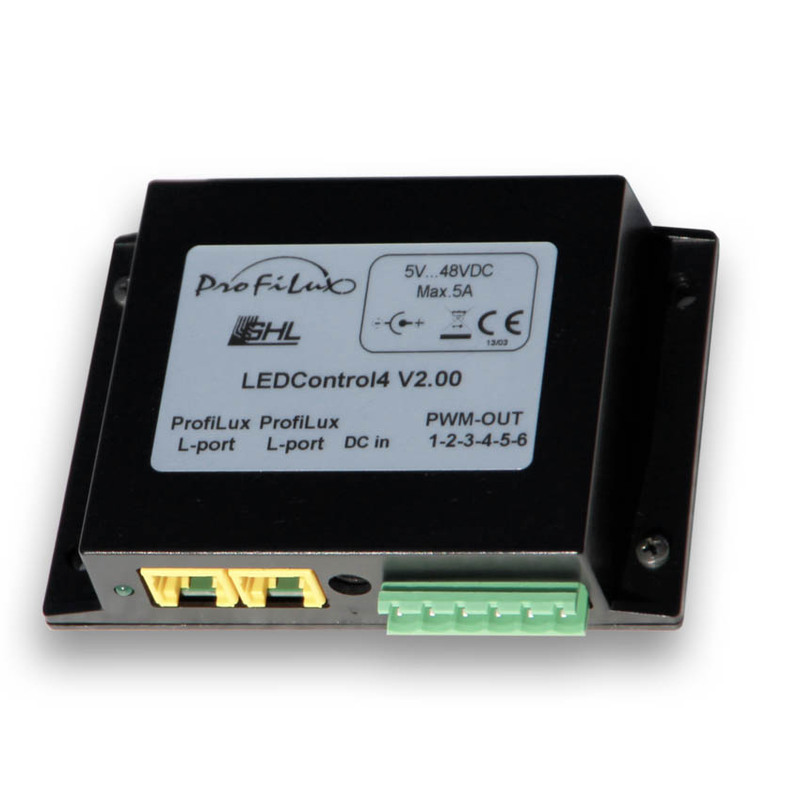 LEDControl4 connects to one of the 1-10V interfaces of ProfiLux and outputs PWM signals, which can be used to control LED lights or LED drivers. Some LED lights manufacturers offer suitable adapter cables to connect to your lights on LEDControl4 V2. You can download the manual to LEDControl4 V2 in our download area.